Two years’ worth of “Gunsmoke” scripts. World War II propaganda by Arch Oboler about an army private who captures a sophisticated enemy lieutenant. 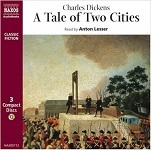 Orson Welles’ adaptation of Charles Dickens’ sprawling novel of the French Revolution. “It is a far, far better thing that I do, than I’ve ever done. It is a far, far better rest that I go to than I have ever known,” says Sydney Carton at the guillotine. Entries (RSS) and Comments (RSS) | 54 queries. 0.176 seconds.